My family had lived in Soho at the heart of the West End since the 19th century. My late uncle, Jim Wallder, lived in Meard Street, off Wardour Street, when the Second World War started and because he was a builder by trade he joined the Heavy Rescue Squad of the ARP. Jim claimed he became the Head of the Heavy Rescue Squad for Westminster and his rescue vehicles operated from an underground tunnel beneath buildings in Savoy Place and Adam Street. His HQ was an adjacent room where Charles Dickens had once worked and on which he based the Thieves Kitchen in 'Oliver Twist'! My uncle attended the scene after a landmine crashed through the ceiling of the 'bombproof' celler of the Cafe de Paris in Coventry Street where danceband leader Ken 'Snakehips' Johnson was performing: it exploded right in front of the Orchestra killing many of the musicians and dancers. He was also among the first on the scene in 1941 when another landmine hit Dukes Court in Jermyn Street and he helped remove the body of the legendery popular singer Al Bowlly who died from blast. Uncle Jim reckoned more people were killed by bomb blast, which burst your lungs, than by flying shrapnel and masonry. Once he stopped a woman trying to re-enter a burning building. "Where you going?" he asked her. "My sandwiches are in there, I'm going back to get them." she replied. "Get down that shelter, woman! It's not a picnic, it's a bloody war!" Jim yelled. Pulling bodies from burning buildings was the worst part of the job. After the War he could eat roast beef or roast chicken. But he could never eat roast pork again. By the way, Jim Wallder was the first person ever to appear on television. He was the delivery boy who was delivering groceries to a house in Dean Street in the 1920s where James Logie Baird had built the first TV apparatus. Baird needed someone to sit in front of the camera whilst he looked at the TV screen in the next room. This fact was mentioned in the London Evening Standard when Jim died in 1984. 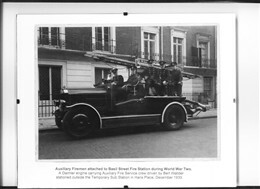 I don't have a photo of Jim during the War but I do have one of his brother Bert, my late father who also lived and worked in Soho, taken in 1939 with other Auxiliary Fire Service firefighters. Although he was stationed in Basil Street, Knightsbridge, they were often called to fires in the West End to support the local Brigade. If Jim was alive today he could tell a few stories about those times, believe me. This page was added by Jeff Wallder on 26/11/2010.